It's been an exciting year for food. We already rounded up our favorite cookbooks and food books, and you can expect several more food-related round-ups throughout the rest of the month. After watching our stomachs oh-so-slowly expand this past year, we feel pretty confident in our assessment of 2011's food trends. We saw some great new restaurants pop up, had some memorable meals and fabulous drinks. A lot of people cringe at the word "trend." After all -- how does one really determine if something is a trend, or a fad. Certainly, media professionals have been accused of creating trends where there really aren't. But in the past year we've seen a lot of activity around all of the examples below. Although you may have seen lots of these grow before 2011, the 11 trends below really reached their apex in 2011. Feel free to express your disagreement in the comments below but this is our list and we're sticking to it! 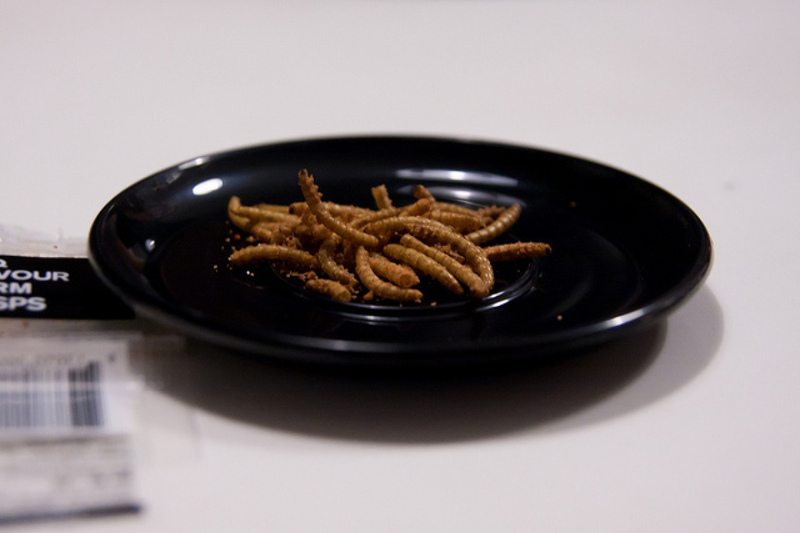 There was a huge crop of stories (see <a href="https://www.huffpost.com/entry/eating-insects-entomophagy_b_1081207" target="_hplink">here</a>, <a href="https://www.huffpost.com/entry/insect-eating_n_950827" target="_hplink">here</a>, <a href="http://www.newyorker.com/reporting/2011/08/15/110815fa_fact_goodyear" target="_hplink">here</a> and <a href="https://www.huffpost.com/entry/angelina-jolie-kids-eat-bugs-video_n_902477" target="_hplink">here</a>) about the prevalence of critters as cuisine this year. Although insects aren't actually appearing on a ton of menus, there has certainly been a media saturation. The stories weren't written for the gross out factor, though -- turns out that insects are not only good for you, but they are pretty sustainable and have <a href="http://earthfirst.com/bugs-the-next-sustainable-food-source/" target="_hplink">low environmental impact</a>. After all, there's a lot of them, so get over your fears and dive into your new dish du jour.